✔ SMART BACKUP CHARGING TECHNOLOGY: Use this cable to charge your new MacBook, ChromeBook Pixel or other USB-C devices via any phone charger, portable charger or multi-port USB charger. ✔ LASTEST USB3.0 STANDARD : Super fast charging time and speed transmission (up to max 5Gbps) ,transfer an HD movie in under 5 seconds.USB 3.0, conforming to the USB Type C Specification version 1.1, 56kilohm, standard identification, which ensures a safe charging at 3.0A Maximum and the speed of data sync up to 5 Gbps. No damage to your legacy USB hub. ✔ EXTREME DURABILITY: With a tested 5000+ bend lifespan, this cable is far more dependable than others in its price range. The nylon braiding adds additional durability and a visually appleaing look. 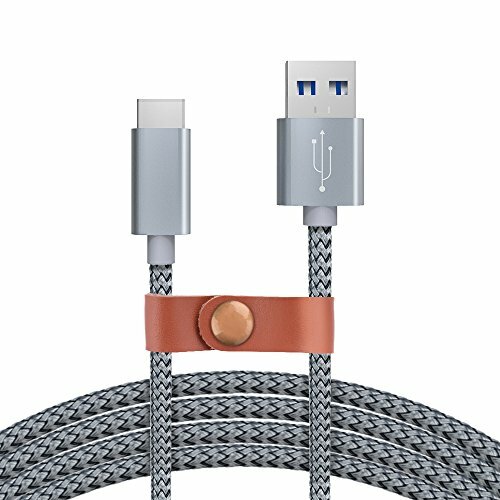 ✔ BEST-IN-CLASS CABLE DESIGN - The cable has a durable nylon braided design with premium metallic housing which makes it easily survive everyday usage and gives it a more stylish and elegant appearance that goes great with your expensive gadgets. The adherence to USB-C specifications ensures 2.4A~3.0A safe charging (Pullup resistor - 56kΩ) and safety of your gadgets. Moreover, the cable has a length of 2 meter that allows for ease of connectivity between devices. ✔ Compatible with the new USB C devices such as LG G5,LG V20,Apple Macbook, OnePlus 2, Google Nexus 5X, Nexus 6P, Google Pixcel XL,Pixel C, Pixel xl, New Nokia N1 tablet, Lumia 950, Lumia 950XL, ChromeBook Google Pixel, Asus Zen AiO, Lenovo Zuk Z1, HP Pavilion X2, ASUS ZenPad S 8.0,Huawei P9 ,Huawei Mate 9 and other devices with USB C connector.